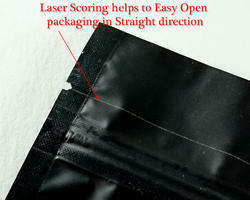 Manufacturer of a wide range of products which include laser scored bags. Today’s consumer food products market is flooded with many competitors. Customers purchase decision is based on presentation of good quality packaging and most preferably conveniences of the packaging. We are introducing laser optimized packaging to make life easier. Laser is the new technology for smart packaging with added values. Laser scored pouches are very easy to open specially for growing elderly population and arthritis patients. Pharmaceutical products & many more others. Laser scored pouches opens in straight line avoiding damage of zippers and after opening, the pouch looks more clean due to precise opening. Start using laser scored / scribbled pouches and watch your sales go high. Order samples from us today and try opening pouches with and without laser scored and feel the difference. Laser perforated vegetable and fruit bags. Today Half of the fruits and vegetables gets spoilt before they are consumed due to improper packaging. Vegetables respire and loose moisture after they are harvested. Even though vegetables stored in cooled controlled environment, it still loose freshness and looks loose due to moisture loss fromthem. Fruits gets ripe with biochemical reaction so it needs perfect size of vent in packaging so ethylene gas escapes and stops fruits getting ripe faster. But with the same time fruits should retain moisture so fruits has to get packed scientifically to keep moisture and freshness intact. Processed vegetables and salads loose quality and deteriorate rapidly without proper packaging and ventilation. Now introducing new technology to pack fruits and vegetables in laser perforated fruit bags. Different fruits and vegetables requires different size and number of holes in bags to maintain freshness longer. Selection of plastic material, laser hole size and number of holes on each bags depends on what fruit or vegetable is packed and what is the total weight to be filled inside one bag. Laser perforated film has precise control over size and number of perforations that allows control over permeability and respiration of the packed product. Laser perforated bags has natural ventilation inside packaged product thus prevents drying and suffocating. Laser perforating makes exact permeability in each pack, registered holes accurately positioned on the film or bag improves life 4 times of packed product. Our films / bags has Anti fog / mist control property for optimum transparency under temperature difference.